What to eat in Kuantan: Hakka "Lei Cha"
Not everyone is aware of such a dish & here in Kuantan, "lei cha" is not widely available. 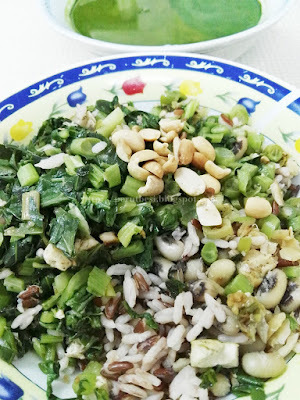 I was thrilled to discover this place after having so much meat the night before I got to taste this aunty's "lei cha". 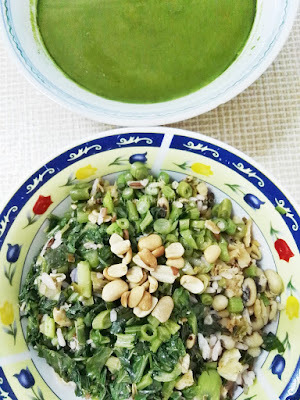 Here in Malaysia, this 'savory green tea' is accompanied by a bowl of warm rice + vegetables. 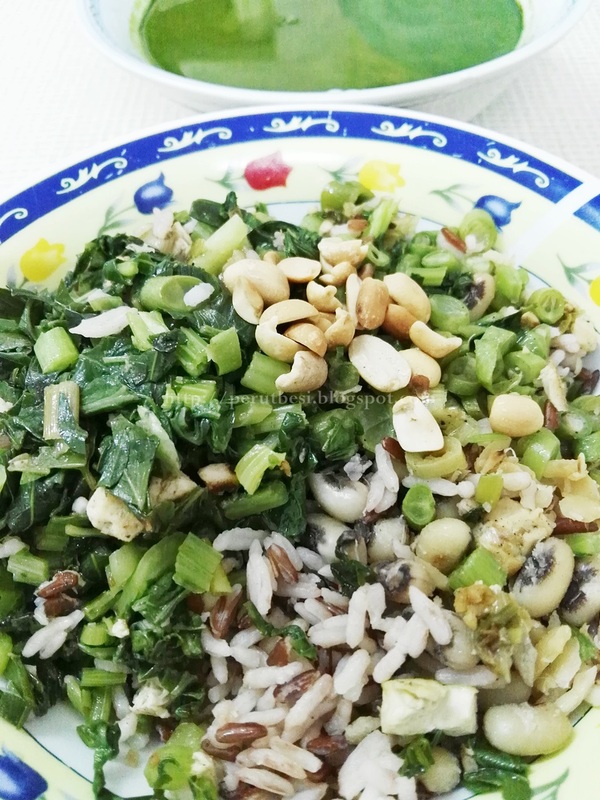 Some shops/stalls serve brown rice, while some just serve the normal white rice with a variety of stir-fried green vegetables, beans, pickled vegetables & fragrant-roasted groundnuts. 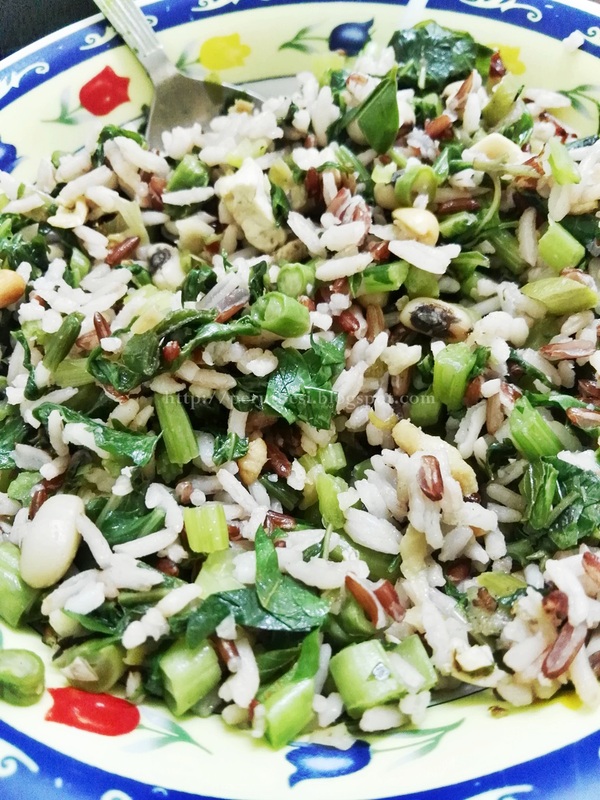 Some people like to have their "lei cha" mixed with the rice, but I prefer to have my rice on its own & the "lei cha" like a soup to accompany the rice. 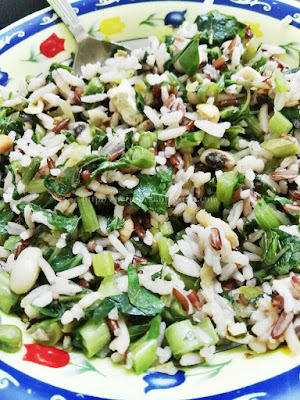 It's like having a 'Chinese salad with rice' that keeps your tummy satisfied 'til the next meal. My husband & I entered a contest that will require most votes to win. Appreciate if you can help or even get your friends to help too...hehe. Thanks a bunch! p/s: The contest allows voting for the same photo once a day, everyday, from now 'til 31st August 2016. Lately, I've been feeling slightly more nostalgic & wanting to find certain cuisines that I used to enjoy back in PJ, right here in Kuantan. 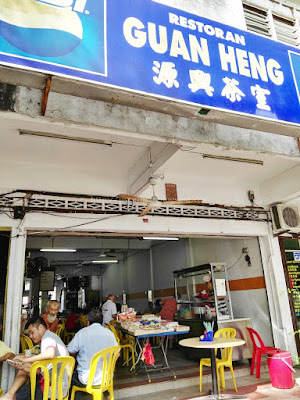 Thanks to uncle FT, my "Kuantan dad" since uni days, I got to enjoy a delicious herbal soup noodles breakfast yesterday morning at Bukit Sekilau area. It's a very simple coffeeshop with 1 stall in the morning (yeah, this is available only for breakfast, I think. Not sure if she's opened for lunch as well), selling noodles & uncle FT brought me here to try her herbal soup noodles. 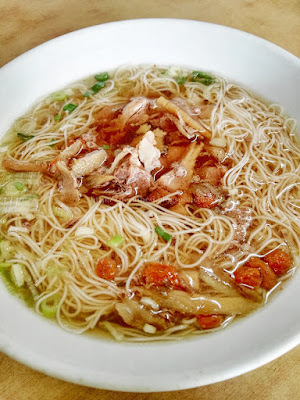 Usually, the soup is served with yellow noodles, but I opted to have it with mee suah instead of yellow noodles. You can order herbal duck, herbal chicken or herbal pork ribs with your noodles as well, with the duck noodles a ringgit more than others. This probably is one of my shorter posts, eh? :P I thought it'll be nice to just share so that if you've cravings as such, at least you have an option. Cheers! Any day is a good day for some barbecue pork ribs, eh? Couple it with a nice, cold bottle of beer/soda, I think it'll make the end of your work day one that's relaxing enough to keep you satisfied 'til you tuck into bed for the night's rest. In this final post of the Houston trip (yes, apologies that it took me so long to complete things these days), I would like to share with you my experience at Rudy's, a fast-food style BBQ restaurant that sells delectable pork & beef ribs, sausages, sandwiches & more! My dinner for that evening...couldn't finish that gigantic smoked potato! I went to the branch of Rudy's at the Tomball Parkway area. It's a typical southern-looking ranch-like-restaurant that serves what the southerns do best, barbecues! The skyline on that evening was extremely beautiful! No filter! As you enter the restaurant, you'll find yourself greeted by a mini convenience store like area on your left, where you can purchase chips & snacks to accompany your meal at Rudy's. Walking further up, you'll find a canteen-style area to order your food. 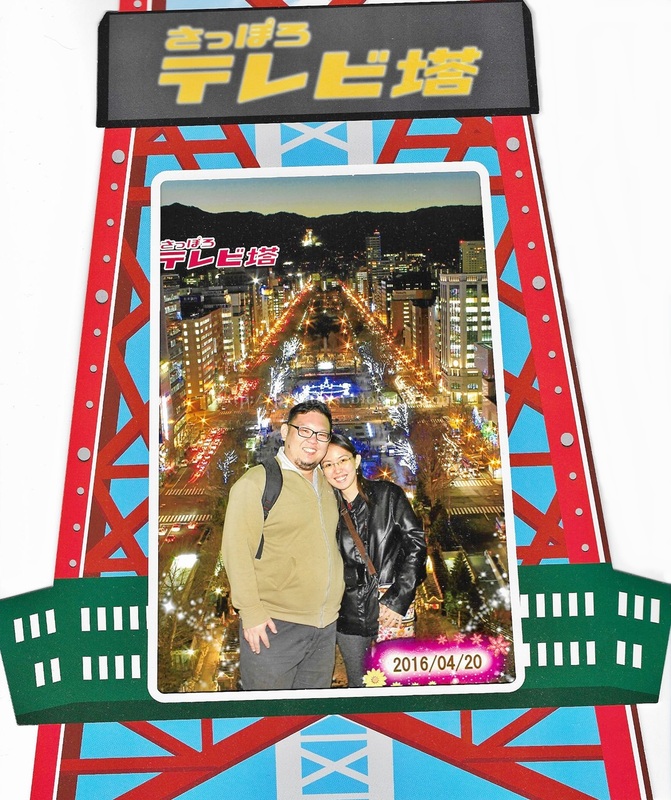 As it was my 1st time there, I was quite lost as to what I should do...hahaha. All you need to do is to grab a bottle of drink of your choice, be it beer or soda or juice (I think they have that too), then pick your side dish from the chiller (optional) before ordering your hot food at the counter. As this is a BBQ restaurant, I had 1/2 lb of pork ribs & as a sucker for potatoes, I ordered their jumbo smoked potato as well! You can actually order more or less than 1/2 lb of ribs. It's all up to you, just like purchasing meat/ham over the meat section of the supermarket. I have to say that I enjoyed the juicy & flavorful pork ribs although as usual, I find Texan flavors slightly too salty for my liking. I love it that the meat was tender & succulent & has that smokey, charred charcoal taste on the crust of the ribs. 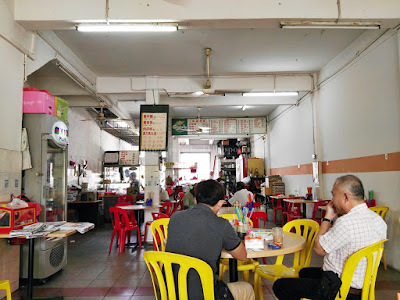 Here are some photos of how the restaurant looks like. It's a weekday & probably too late by the time I took the photos to see the dinner crowd. Love the view that evening. On one side, it was really blue, on another, it was greyish with hues of red, orange & yellow. Oh, so lovely! Business hours: Sun - Thurs 7:00a.m. - 10:00p.m., Fri & Sat 7:00a.m. - 10:30p.m. Tex-Mex cuisine is very popular in Texas, so one of the evenings, the team had dinner together at El Tiampo Cantina, located at Vintage Park. The restaurant may look quiet from the outside, but as the door opened, whoa...the place was packed even at 6:30p.m.! Thankfully the team made a reservation, especially since it'll be a large group of like 20 over people. The interior of the restaurant feels very 'old school + Mexican'. The stairs to the 1st floor was really steep, so walking up the stairs with heels just didn't feel like the best idea, especially after work with the laptop & all. Lighting was REALLY dim, so please excuse my photos quality. 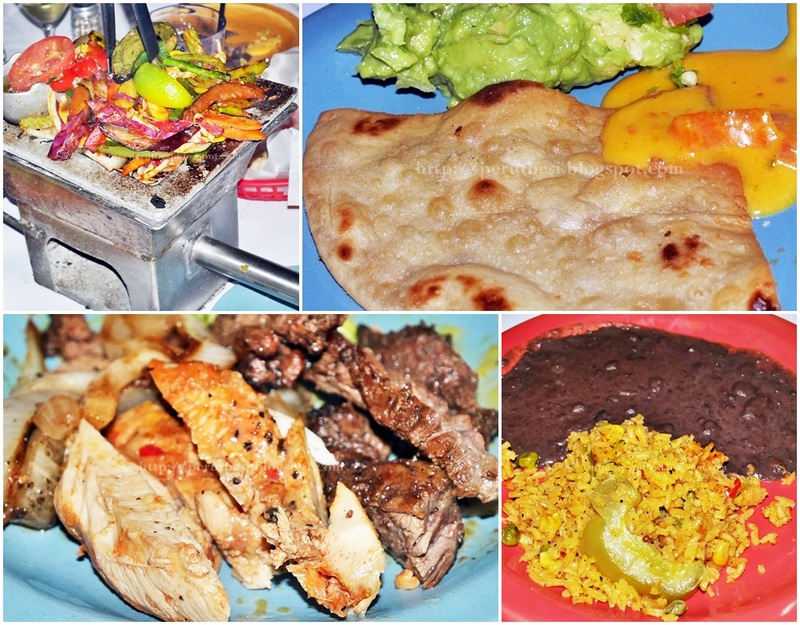 Their menu is extensive, with tonnes of Tex-Mex dishes! If you're new to Tex-Mex dishes, you'll be totally lost. AK who's vegetarian was really lost with the menu & she gave up looking at it after a while. Thankfully, the team lead pre-ordered the dishes for that evening with some vegetarian dishes for our Indian-vegetarian colleagues. Business hours: Mon & Tues 11:00a.m. - 9:00p.m. ; Wed & Thurs 11:00a.m. - 9:30p.m. ; Fri & Sat 11:00a.m. - 10:30p.m. ; Sun 9:30a.m. - 9:00p.m. I'm quite a fan of Vietnamese Beef Noodles/Pho & it seems like Pho An 2 is a common restaurant where the team will dine at during meeting/workshop weeks after work whenever they're at Houston. What's not to like about clear broth with generous servings of beef, clear rice noodles called bánh phở & some fresh sprigs of mint leaves, green lime & bean sprouts? :D It's strictly non-vegetarian though. Those who don't take beef can opt for chicken, so don't get too disappointed! We also ordered some appetizers/snacks/side dishes. This was quite tasty, with diced shrimps & vegetables wrapped in beancurd sheets & deep-fried 'til golden brown. It was quite juicy & still has the slight 'sweetness' of the shrimps. I did't find this very special somehow. It was crispy like a usual spring roll & that's about it. Their menu...quite a lot offered here! So, now you have one more dining option whenever you're in Houston for work or vacation ;) Stay tuned for the last 2 posts of this series. 'Til the next post, have loads of fun eating & exploring various food around you!